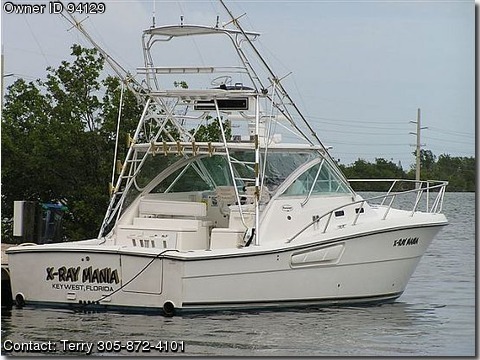 Call Boat Owner Terry 305-872-4101. Ac, am/fm stereo cd, auto anchor, auto helm, 2 bilge pumps, bow pulpit, carpet removable, coast guard pack, depthfinder, dinghy 14ft, dockside power, dowriggers, dual controls, fishfinder, flybridge, full gauges, galley, generator, gps, co2 system, head, hydraulic steering, knotmeter, outriggers, radar, radar arch, refrigeration, shower, storage, stove,micro, convection ovem, trim tabs, 3 batteries with charger, vhf radio, loaded, sleeps 5-8, documented and reg, prof maintained, pics on request, 4 outriggers, coaxial cable and connectors for tv. Price is $129,000 OR BEST OFFER!